Given how sociological concepts, theories, and perspectives can be applied to many of the relatively smaller problems of everyday life, such as improving urban spaces or enhancing work and productivity, it’s odd that the majority of sociology done in the UK remains behind closed doors, in lecture rooms, academic libraries, and conference halls. Nick Fox explains how a group of UK sociologists has launched a curriculum in “applied sociology”, which aims to equip new graduates with the skills, knowledge, and professional outlook required to improve workplaces, organisations, and communities. Sociology is a subject that works best when it faces outward, towards the world of people and their social groups, organisations, and institutions. Towards the natural and built environments that people inhabit. Towards the ideas, beliefs, values, and norms that people use to constitute their social worlds on a day-to-day basis. And towards the processes of power and resistance that mark out the divisions, stabilities, and continual change within society. Sociologists have much to say about the grand problems facing contemporary society, from climate change and migration, to wealth and health inequalities. But their concepts, theories, and perspectives can also be applied to the smaller problems of everyday life, ranging from improving urban spaces to enhancing work and productivity. So it’s odd that the majority of sociology done in the UK happens not in workplaces or communities, businesses or local government, but behind closed doors in lecture rooms, academic libraries, and conference halls. The overwhelming majority of people with the job title “sociologist” work in universities and research centres. The British Sociological Association (BSA) – UK sociology’s professional body – has few members outside these academic circles. This isn’t the case everywhere. In the US and a few other countries, sociology is flourishing in all kinds of workplaces: in business and industry, local and national government, and in charities. It is often called “clinical sociology”, possibly because people consult sociologists with work or other problems in the same way they would consult a doctor, therapist, or counsellor, though in clinical sociology the patient is an organisation or company rather than an individual. Perhaps a couple of examples will help. Applied sociologists from Bentley University analysed how medical records are produced to help the transcription industry develop better documents and use speech recognition technology effectively. A university sociology department in Norway established an applied sociology clinic in a Trondheim shopping centre, working with urban planners, businesses, and community bodies who approached them to address local issues and challenges. These are the kinds of projects we’d like to see UK sociology undertaking too. After all, every year, there are 30,000 new sociology graduates in the UK (source: HESA data). That means about half a million citizens in the UK have a sociology degree! That’s a lot of expertise going to waste while there are so many problems that could benefit from a sociological insight. Since 2016, my sociological colleagues outside academic institutions and I have been asking why UK sociology is so far behind the curve and what can be done about it. Part of the problem is demand: maybe UK businesses and public sector bodies just don’t know what sociology can offer. That means sociology getting a lot better at explaining what it is and what it does. Developing a new job role is a big ask, of course. Which will be the first UK company to employ a sociologist and put that job title on their office door? Who will invest in a sociologist when they may be more familiar with economists and work psychologists? But if demand is part of the challenge, then so too is supply, and perhaps that’s a good place to start. We need enough sociologists with the skills, knowledge, and, just as importantly, the professional outlook and demeanour to fill the jobs when demand gets going. That’s why in 2017 the BSA’s “Sociologists outside Academia” group decided to stop moaning about the lack of applied sociology and do something about it. A major project was launched with the goal of developing a curriculum in applied sociology that can be rolled out to all sociology undergraduates in UK universities. This way a graduate with a degree in sociology will have the tools to use her or his sociological knowledge and skills to make a difference in a workplace or a community, not just as a meal ticket into a generic graduate job. A team of ten academic and applied sociologists agreed a definition for applied sociology: “solution-focused sociology, analysing and intervening to address, resolve or improve everyday real-world situations, problems and interactions practically and creatively”. 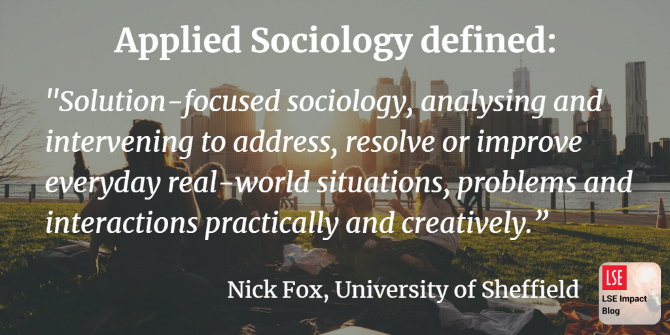 With that definition in mind, what is involved in becoming an applied sociologist? We set about identifying the learning outcomes necessary to work as an entry-level applied sociologist. We organised these outcomes into four key themes – knowledge, skills, employment and careers, and practice. First and foremost, an applied sociologist needs the sociological knowledge to be able to work independently to analyse a situation and offer a workable solution. For instance, how might a concept such as social control or a systems approach to organisation help address how a business operates smoothly? So the “knowledge” component encourages students to integrate and synthesise what they’ve learnt during their degree, enabling them to gain insight into the practical relevance of sociological knowledge, as opposed to its theoretical deployment in academic research. Applied sociologists also need a wide range of skills, some of which are generic and transferable, such as communication, problem-solving, observation, and listening. Others are more specific to sociology, including the capacity to appraise evidence critically and design and conduct research. They will also need to be able to work independently to seek to address, understand, and resolve a wide range of situations and problems in work or community settings. Considerable self-awareness and emotional maturity will also be required. Resilience and resourcefulness will also be required to establish and sustain a career as an applied sociologist. For this reason, we include materials on employment, careers, and the ethics of applied sociological working. Applied sociologists need to understand different models of working, career development, and the ethics of working as an applied sociologist in a variety of social contexts. This is what the “employment and careers” component explores. Finally, because applied sociology is a practical activity, we also emphasise the need to provide students with practical experience as part of their learning. A practice component supplies the means to deepen understanding of work as sociological practitioners and try out the concepts, theories, and project management and research skills developed earlier in the degree. It will help students gain insight into what it means to actually do applied sociology. Our curriculum doesn’t attempt to timetable lectures, seminars, or placements: that’s up to each university to decide, based on their existing course structure and their style and orientation towards learning. But we do offer some suggestions for learning activities and assessment of this curriculum; resource material for staff adapting the applied sociology curriculum to an individual degree programme; links to useful websites, including international bodies supporting applied sociology; and a full list of sociological concepts, theories, and the skills with which applied sociologists need to be familiar. We are offering the curriculum pack free to UK departments of sociology and related disciplines. It will provide an outline for an undergraduate module to be studied in the third year of a sociology degree, though it could also form the basis for a Master’s in applied sociology. The curriculum was formally launched at the BSA conference in Newcastle last month. But you can read the entire curriculum document on a bespoke website. If you work in a UK department of sociology or related discipline you may also download the curriculum document in Word or pdf formats. More information on the BSA-SoA curriculum in applied sociology is available here. This blog post first appeared on the Real World Impact blog. Featured image credit: Vitor Santos, via Unsplash (licensed under a CC0 1.0 license). Nick Fox is honorary professor of sociology at the University of Sheffield, having previously been professor and director of teaching in the University’s School of Health and Related Research. Since then he has worked as an independent scholar, with recent work on sexualities, creativity, emotions, technologies and health. He has been co-convenor of BSA Sociologists outside Academia (SOA) since 2013.